Sunset over Seneca Lake from Chateau Lafayette Reneau. 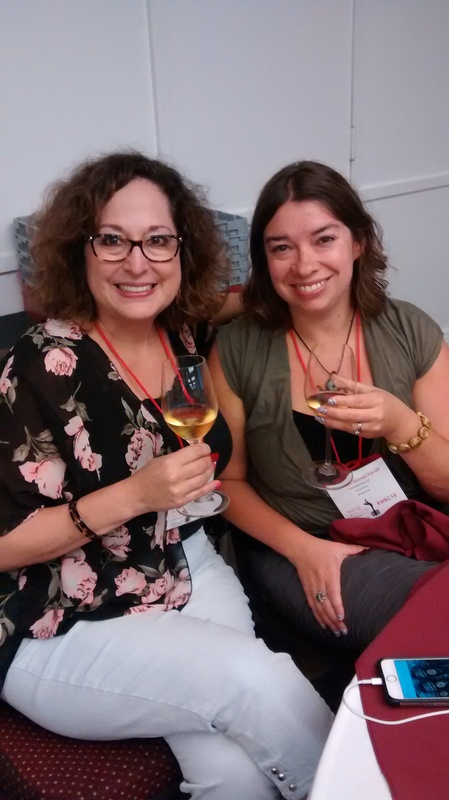 It’s been two weeks since the 2015 Wine Bloggers Conference (WBC), my second WBC and my second time being truly impressed with the events that Zephyr Adventures organizes. The elite sponsors for this year’s WBC—the Finger Lakes Wine Country Tourism Marketing Association, Corning Enterprises, and the Elmira Corning Regional Airport—went above and beyond in introducing us to Finger Lakes wines and the region itself. Corning’s sights to see and places to eat will be another post, but for my first takeaway from the WBC, I’ll let the wines take precedence. 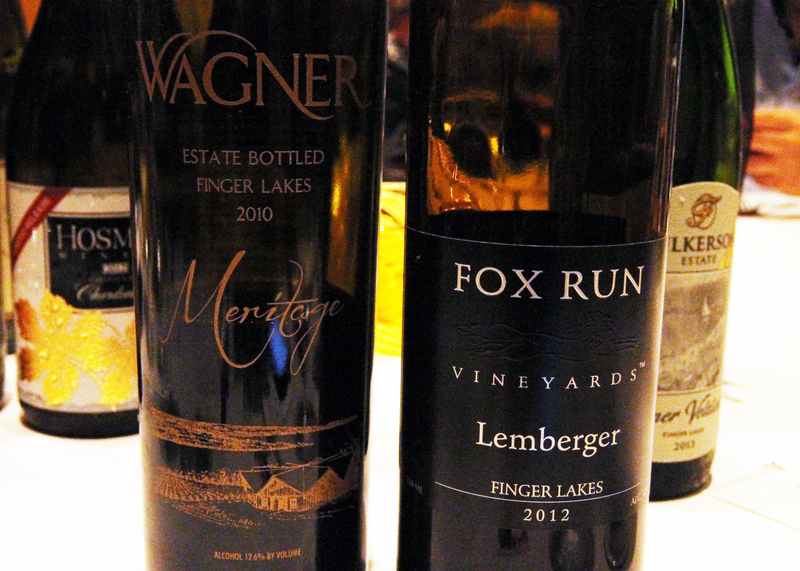 You may have read my Pre-Con Preconceptions post about the Finger Lakes, and #3 on my list was that the Finger Lakes produce all riesling all the time. They do produce a lot of riesling, 22,000,000 cases of it a year according to the Finger Lakes Wine Alliance. But the vastly differing microclimates of the region and its variable weather patterns, as described by Alan Lakso of Cornell University in a great introductory session, force Finger Lakes winemakers to experiment with new grapes every year. That experimentation was our reward! Luckily, the winemakers realized we might tire of the region’s signature wine after four days, so they brought in many other varietals to show off. Of course, there was plenty of riesling, but most of those were quite dry with an acidic, mineral-laden pop. 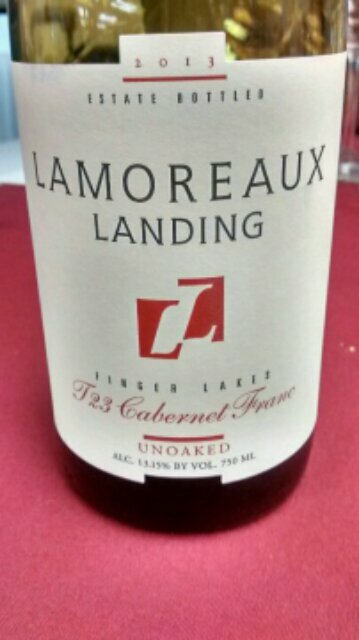 It showed a conscious effort on the winemakers’ part to move beyond my #4 pre-con preconception, that the Finger Lakes’ wines are all crazy sweet. 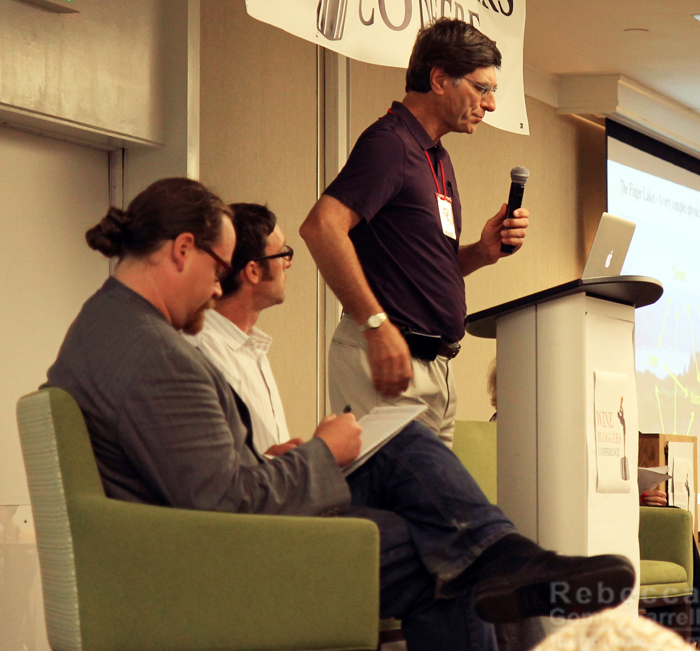 Some winemakers I spoke to admitted sweeter rieslings will probably always be their primary product—American wine drinkers have a sweet tooth, y’all—but they are avidly seeking, and in my opinion, earning, a more distinguished wine reputation. They are also branching out to hard ciders, which excited me greatly. 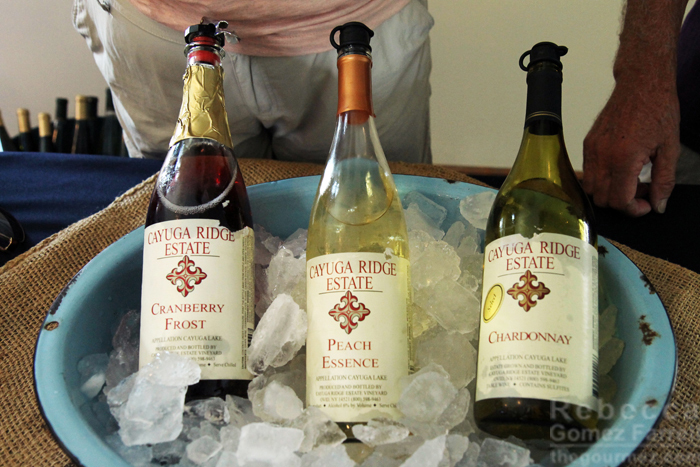 I’ve been avidly rooting on the US-based cider industry’s discovery of traditional, drier methods of making delicious alcohol from apples for years, and I was thrilled to discover some Finger Lakes wineries doing so with finesse. Keep in mind as you read through my list that memorable doesn’t necessarily equal best wines. 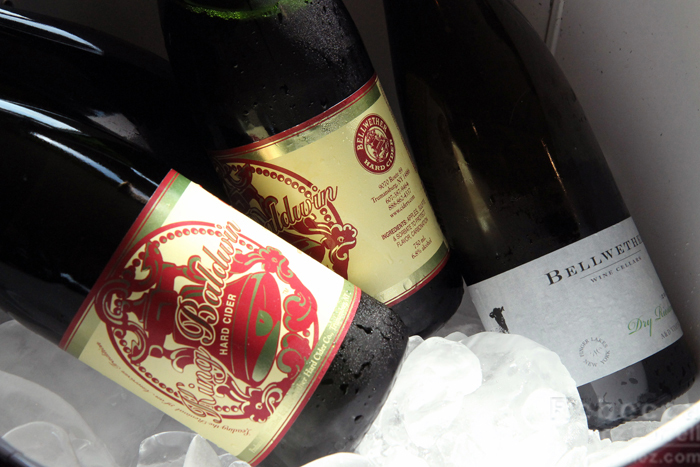 Rather, these are the wines—and ciders!—I’m still thinking about weeks later. That said, they are all pretty darn good, and I’d love to explore them at my leisure rather than in the inevitable time crunch of the WBC. 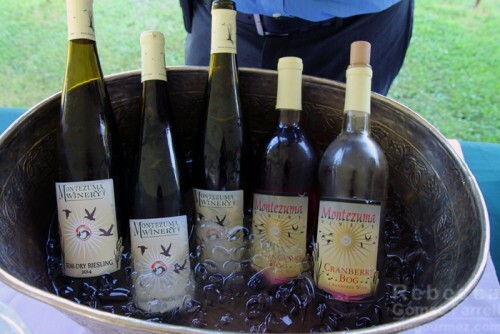 With all my talk about disliking sweet rieslings, you may be surprised that some of my choices here are ice wines. But I have the same sweet tooth I just disparaged—I simply feed it during the dessert course and not at the savory ones. One of only two rieslings to make my list, and it’s a beautiful one. 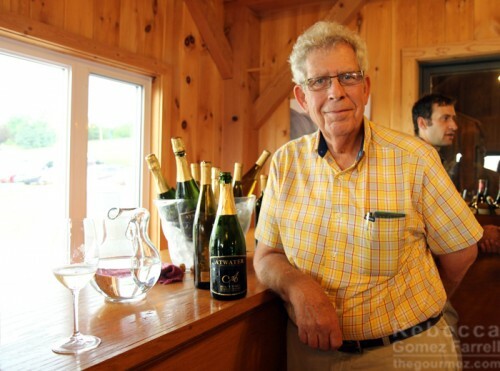 Atwater’s owner, Ted Marks, did the pouring honors during our Watkins Glen excursion. It would make an excellent brunch accompaniment with its french-toast custard notes, buttery mouthfeel, and lively apricot throughout. The wine wears its aging like a comfortable grandmother’s sweater. I must also mention Atwater’s 2014 Chardonnay, which I tried during the white wine live-blogging session, because it embodies the Finger Lakes’ spirit of experimentation. Atwater followed the amber wine production method, with extended skin and stem fermentation for a white wine, and opted to bottle it unfiltered, yielding a muddied sunset in the glass. I’m not sure how much I liked it, but I am certainly thinking about the orange oils I tasted and its singularly unique profile. 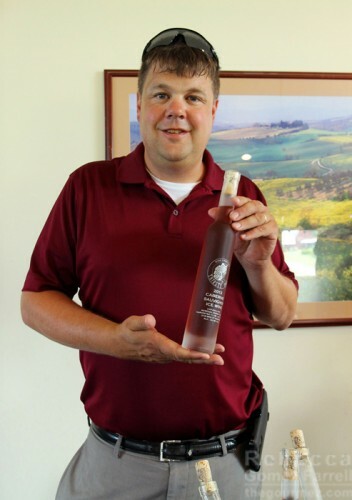 The Cabernet Sauvignon Ice Wine as modeled by Thirsty Owl’s representative. 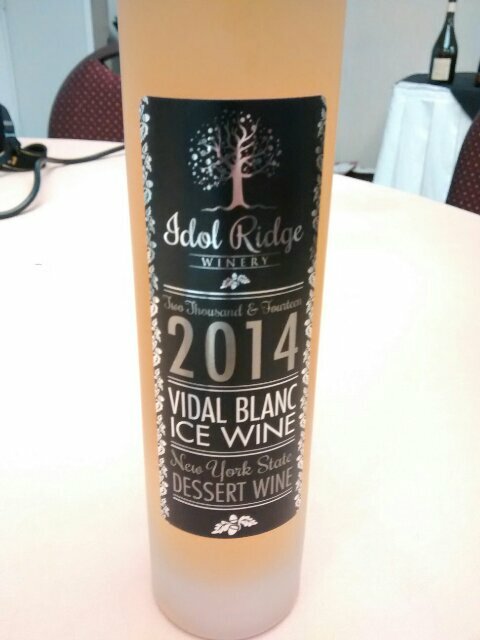 This delicious ice wine gets its extra juicy and jammy cassis notes from the grape skins being left on during the winemaking process. On a hot, humid day touring the Cayuga Lake Wine Trail on the post-conference excursion, it made for a very welcome refreshment. I ran into this, the first of several ciders of the conference, walking through downtown Corning on my way back to the Radisson from the Gaffer District welcome reception. Volo, a bar along the way, hosted a tasting we couldn’t resist. Maybe it was having just spent 9 hours travelling cross-country, but I’d like to think it was the 12 varieties of apple Hazlitt uses in their cider that made it so soothing yet adventurous. Slightly sweet, but mostly memorable for its bold apple taste. 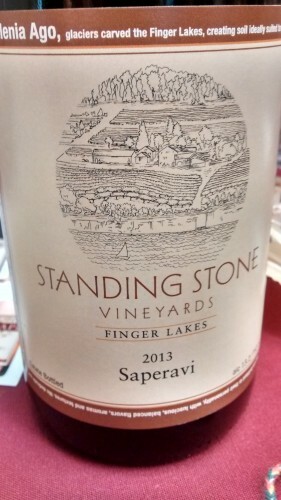 Leave it to Finger Lakes winemakers to suggest combining two of their fruit wines together! At the Cayuga Lake post-excursion, that’s just what Cayuga Ridge Estate’s representatives did. I braved the combination…and loved the hot tamale effect of drinking the tart cranberry and sweet, sweet peach together. I came across this wine during the pairings dinner put on by the Corning Museum of Glass. Exceptionally well-balanced, this Bordeaux blend is a gorgeous wine with lively black cherry notes and a cocoa-rounded air of sophistication. A touch of blue cheese deepens its complexity. This dry cider uses two apples with a lot of history in the USA: the Tompkins King and the Baldwin. My notes read “tight, full, a lovely champagne of ciders,” and I’ll stick by that, though I wish I had another bottle to make sure.…I tasted it on the Cayuga Lake post-conference excursion. No, this wine is not from the Finger Lakes, but it is from the WBC, particularly the Wines Across the Andes session, during which we had the pleasure of learning about the Chilean and Argentinian wines of the Montes and Kaiken labels directly from Aurelio Montes Jr., a second-generation winemaker for the sister wineries. Aloe vera on the nose, this sauvignon blanc stirred up images of a high desert with the sharpness of cacti and tumbleweeds. I honestly didn’t think I’d enjoy any non-dry rieslings this trip, but Montezuma Winery proved me wrong with this offering. The intriguing push–pull it exhibits between its sweet side and its sharp acidity brought a smile to my face right away. It’s a great combination if you’re in for a tug-of-war in your mouth. I didn’t highlight any, but I should note that many of my fellow bloggers were impressed by the Finger Lakes’ brut sparkling wines, particularly the chenin blancs and blanc de blancs. The ones I had were great, but they didn’t offer the lasting impressions the wines on this list did. Go forth and let your taste buds experiment with these experimental creations! Me and Rebecca of My Vino Rules doing just that after Saturday’s lunch. 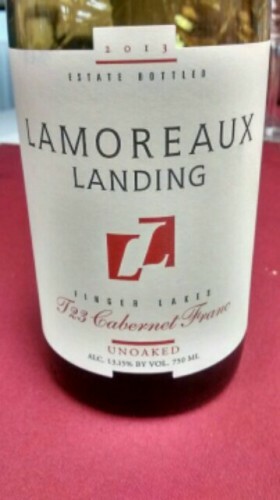 Yes, all sorts of good Cab Francs, and I agree that the Lamoreaux was particularly delightful. Alas, I missed the ciders! I should have tried those out. Missed the ciders?! For shame! Not that we weren’t at a wine conference, of course, but there were definite apple treasures in the bunch.